Click the image above to view the full 2017 Localicious Hawaii recap report. 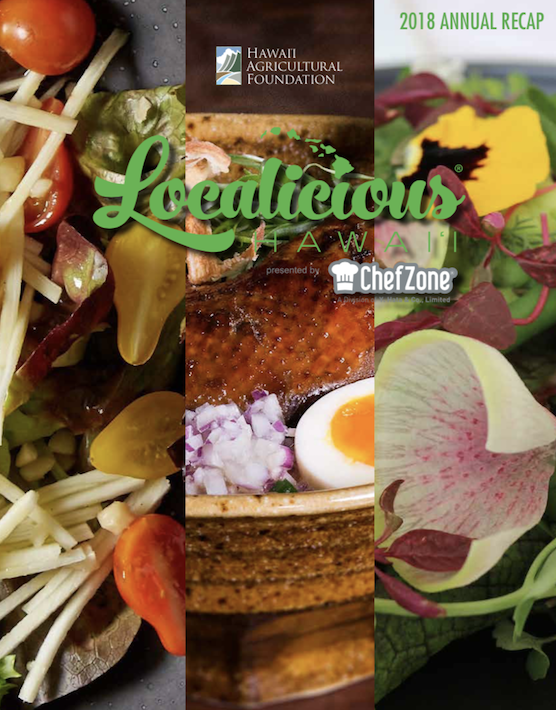 March 2018 marked our fifth — and largest — Localicious® Hawai‘i campaign. Thanks to our Localicious® Leadership Council, chaired by Michelle Karr-Ueoka, Wade Ueoka and Troy Terorotua, the number of partnering restaurants climbed 50 percent from last year, and generated more than $65,000 in donations to support agricultural education in Hawai‘i’s public schools. Reaching a record 141 million people through various media outlets, Localicious® Hawai‘i is helping to frame the “buy local, eat local” trend and furthering the movement toward greater food sustainability. The campaign also underwrites educational programs that help students understand where food comes from and the important role farmers play in our community. These programs are the seeds from which will grow Hawai‘i’s next generation of farmers and agribusiness professionals. On behalf of the 2018 Localicious® Hawai‘i Leadership Council, campaign sponsors, and the entire team at the Hawai‘i Agricultural Foundation, thank you for your invaluable support.